Well that may not be true, it may of been more than 2hrs, could of been all day as the pull of the garden and it’s beautiful Plants certainly could trap you for a good day at least! But how did I find myself on the edge of the world set out in Plants many many miles from home, on a sunny September day? Well it was my first Garden Media Guild meeting and I have to admit I felt rather nervous to say the least, shouldn’t of been as they were indeed a very friendly bunch, meeting up with tea and biscuits being served by the incredible modern plant hunter Tom Hart Dyke, who returned from Cornwall that morning after giving a talk down there. What a chap he is, had a great plant chat with him whilst drinking my tea as well as photography chats with a few others. 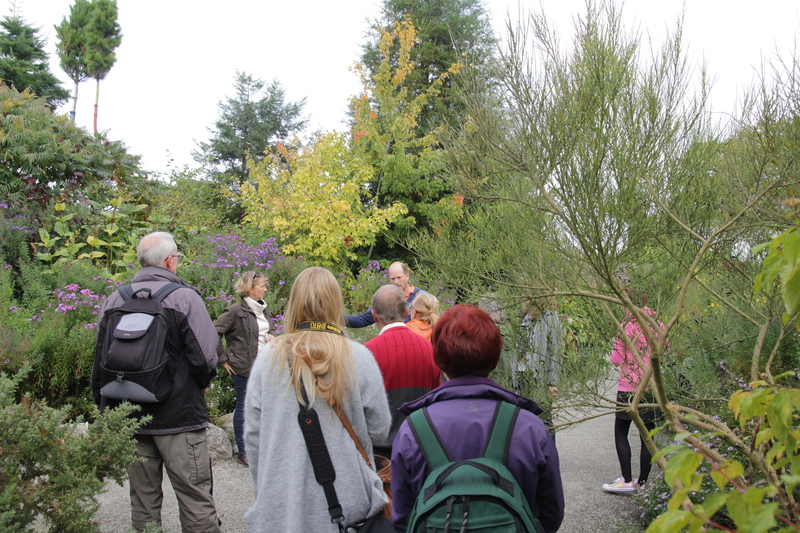 After tea, we went towards the walled garden, where Tom explained that the house had been in his family since the 15th century, the walled garden, where the world garden is set, was his grandma’s herb garden. The idea of the world garden came to him during a plant hunting expedition into Columbia looking for orchids, when they were captured by an armed gang and held prisoner for 9 months! During this time, they were told they were going to be shot in 5 hours and in this life and death moment, the idea of the world garden started in his head, months of drawing making notes they were finally released and sent home only to return once more after getting lost, the gang soon helped them back on the right path and they got back in time for Christmas 2000. Once home, the ideas became reality with him taking over his grandma’s old herb garden, cleared in a few days with help from friends and the garden started to become reality. As for the planting, it’s just a plantspersons dream! So many plants are only found growing here aren’t found growing anywhere else in the uk. Beautiful specimens are everywhere, from the world beds into the glasshouses and poly tunnels. Yes there’s the odd bit of quirkiness like flags flying from trees, trees painted and the odd volcano model, but that just adds to the fun of the garden, we are all guilty about taking gardens too seriously and this is Toms way of adding a bit of fun to the garden and it works. Now about some of the plants we saw on the day! Orbea variegata or the dog pooh plant from South Africa and believe me it does smell like dog poo! Not seen many proteas in flower since I was last at Tresco Gardens but here in the nursery at Lullingstone, was Protea cynaroides ‘Little Prince’ flowering away! Passiflora ‘Anastasia’ what a beautiful passiflora! In all this garden can’t help to inspire and enthuse you, Toms endless amount of energy, enthusiasm and drive both for the garden and the plants is incredible, wish I could bottle it and open it up for days when mine sometimes needs a boast, came away from the garden just wishing I could move it closer to hampshire so I could visit more often and take in the amount of plants growing happily away in world garden over a period of months with Toms knowledge of everyone coming though! From here, we moved on to Great Comp gardens just down the road but that’s for another blog!